Tenants take centre stage in the latest issue of WHQ as we look at the issues across the social and private rented sectors. Everyone agrees that tenants should be at the heart of what we do in housing – but what does that really mean? 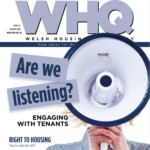 The October issue of WHQ sets out to answer that question with a series of articles by tenants themselves, by campaigners and by people who work to maximise tenant participation and engagement. We kick off with a tenant’s perspective from England, where a Westminster government that once denigrated social housing and imposed policies like the bedroom tax has changed its tune in a green paper. Rob Gershon assesses the current state of play. Closer to home, Fran Bevan reflects on her journey from council tenant to stock transfer to mutual in Merthyr, Sam Shaw argues that a change in negative media coverage of tenants is desperately needed and Steve Clarke argues that it’s time for a Commissioner for Renters to ensure that their views are acted on. Private renters are also calling for radical change. Liz Silversmith explains why they’ve had enough and why legislation in Wales needs to go further on tenant fees and security of tenure. But tenants are facing major problems across both rented sectors. Jennie Bibbings reveals key issues raised by tenants approaching Shelter Cymru for advice that range from lack of redress, harassment and illegal evictions in private renting to unaffordable rent increases, the bedroom tax and even harassment and no-fault evictions in social housing. All of that puts even more onus than before on landlords to ensure that they are listening to the tenant voice and encouraging the broadest possible tenant participation. David Wilton argues that the digital revolution will fundamentally change the way tenants, landlords and communities engage, while Thomas Lambourne says new methods can reach groups of people left out by tenant participation. ‘Tenants at the heart is of course the focus of the strategic review of tenant participation by the Regulatory Board for Wales. Bob Smith outlines the background to the review and argues that it offers a chance to explore ways of doing things differently. Finally, who made these four statements? Keith Edwards has the answers (including one surprising one) plus some ideas about new ways that landlords and tenants can work together. Elsewhere in this issue, we take a detailed look at what a right to housing might mean in Wales. Simon Hoffman explains what it would mean to make the UN right to adequate housing part of Welsh law and Alicja Zalesinska looks at the practical differences this would make. Sam Tsemberis, the architect of Housing First, visited Wales in September and had an optimistic message about the chances of the approach working in Wales. Alex Osmond reflects on what he heard. With more on what housing can learn from other sectors, what Scotland is doing about rough sleeping plus all our regular features, we hope there will be something of interest for everyone in this issue of WHQ. The print edition of WHQ will be with subscribers soon and look out for articles online in the next few days. For more details about subscribing go here.